View and search this newspaper by clicking on the Chronicling America link below. This newspaper comes from the collections of the Kansas Historical Society and was digitized with funds from the National Endowment for the Humanities as part of the National Digital Newspaper Program. 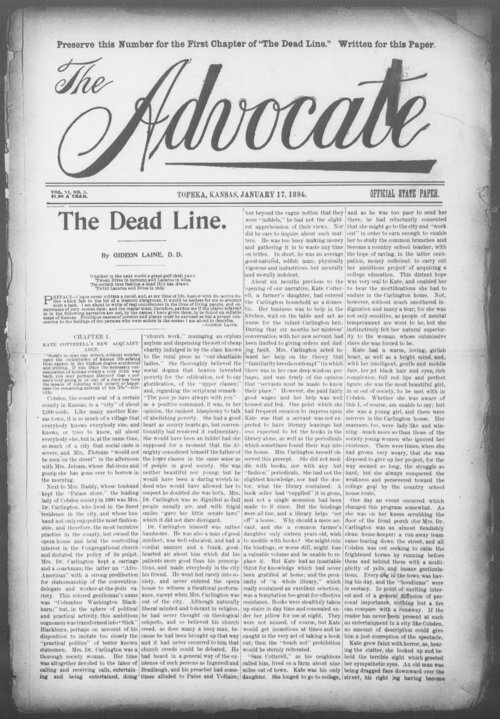 On January 17, 1894, the Advocate and Topeka Tribune resumed its original title of the Advocate. Dr. Stephen McLallin continued to edit the Advocate until about a year before he died on March 4, 1897. By then, the paper was under the direction of William Alfred Peffer, the first Populist U.S. Senator. Peffer had been chairman of the national conference that organized the People's Party and served as president of the National Reform Press Association. He was an important reformer to the extent that Populism was sometimes referred to as "Pefferism."